Broome, Chenango, Cortland, and Tioga counties. 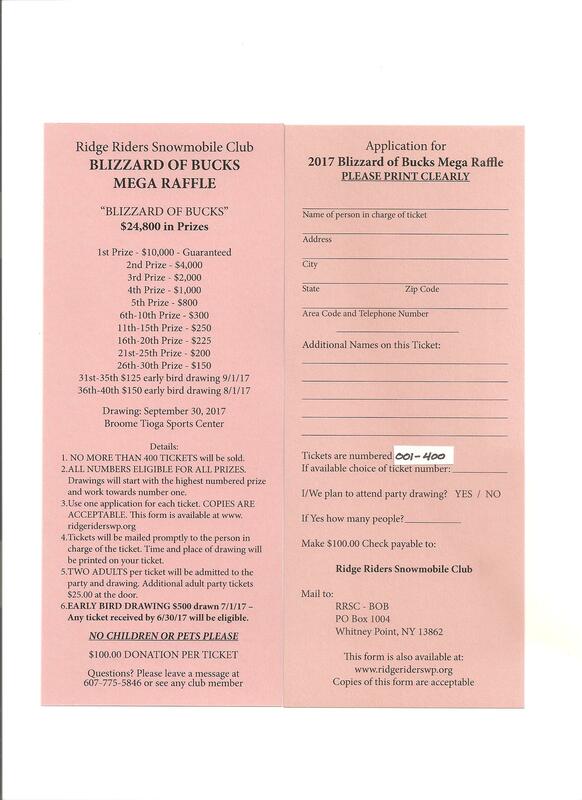 2019 Blizzard Of Bucks Mega Raffle tickets are on sale. There will be over $32,000 in prizes available this year and the 1st prize will be $15,000 guaranteed. There will only be 500 tickets available and every ticket is eligible for every prize as well as allowing two adults per ticket into our drawing barbecue. 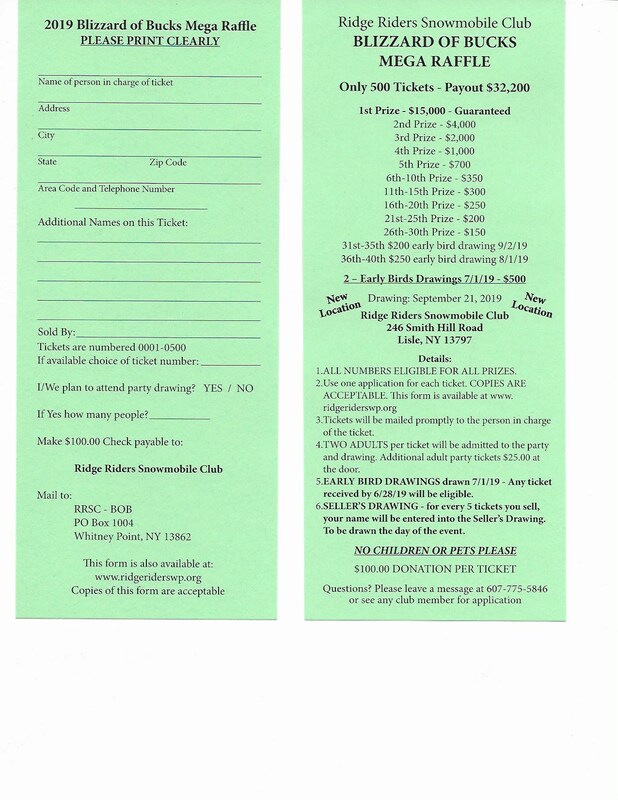 To receive your ticket, please print a copy of the application from the link above and send with your $100 donation to RRSC-BOB, PO Box 1004 Whitney Point NY 13862 or see one of our ticket sellers. 31st thru 35th Sept. 2nd early bird drawings of $200 each. 36th thru 40th Aug. 1st early bird drawings of $250 each. Two July 1st early bird drawings of $500 each. OUR TRAILS ARE CLOSED. PLEASE RESPECT OUR LANDOWNERS. We would like to thank all of you for choosing to be a part of our Club. OUR TRAILS ARE NEVER OPEN TO ATV's AT ANY TIME. PLEASE RESPECT OUR LANDOWNERS, THEY ARE OUR FRIENDS AND NEIGHBORS AND WITHOUT THEM WE WONT HAVE TRAILS. The next monthly club meeting will be Wednesday May 1st 2019, 7pm (NEW TIME) at Sparkys Pub and Grill, 2680 Main St. Whitney Point NY. The kitchen will be open and beverages will be available. Blizzard Of Bucks Mega Raffle tickets will be available at this meeting. We will be in Sparkys meeting room. All trail captains are asked to attend and please bring all worksheets and grooming/ trail time sheets to the meeting. Due to Parks NEW WORKSHEETS POLICY we cannot enter or claim any trail work on a sheet that is 60 or more days old. Memberships will be available at the meeting. Please note new time for our monthly meeting! copyright © 2012 by Ridge Riders Snowmobile Club, Inc.